Business cards contain some contact details of a company or an individual. But business owners now understand the value of the cards in winning the trust of the recipients and converting them into customers. They get some signals about a company’s business from the card design. You come across business cards of all sizes, colors, and designs if you meet people regularly. They introduce their companies, businesses, products, or services by handing out these tiny handy pieces of information. You may be having many cards stacked in your wallet and drawer. Take a good look at modern cards. You will find that they are multi-tasking tools. You can use them as a ticket, bookmark or even a ticket or a sticker. It is not just your conventional first contact point with someone you considered as a potential customer. Today, businesses owners smartly use the cards as a potent marketing tool. 01. What Details To Include? First, decide on the information your card should hold. That is important as there is only a tiny space available, which does not allow for the inclusion of your company’s all the details. Modern businesses have websites, email addresses, fax numbers, mobile numbers, and other contact particulars. Then, your logo and company name also finds the mention. So, give your business card maker only the details that do not make the designer struggle for space. Looking for a business card design? Do not shrink the information to the extent that it is difficult to read at first glance. If you reduce the font size of the text to accommodate for more details, the text may not be as readable as it is online. When printing the letters, they may become messy. Therefore, avoid using the calligraphy lettering style with details. It would be good that you do not use fonts of less than 8pt. While you may be following some design rules when you make your own business cards, use some imagination as well. Take a look at inspirational designs and try to come out with unique and creative design ideas. The emphasis should be on delivering your contact information in your unique way. Most business cards are plain and simple. Others are laden with colors. Which of these types suits your brand identity better? While bright colors are good for giving a touch of freshness and excitement, too many colors are not desirable. It makes space look cluttered and confusing. 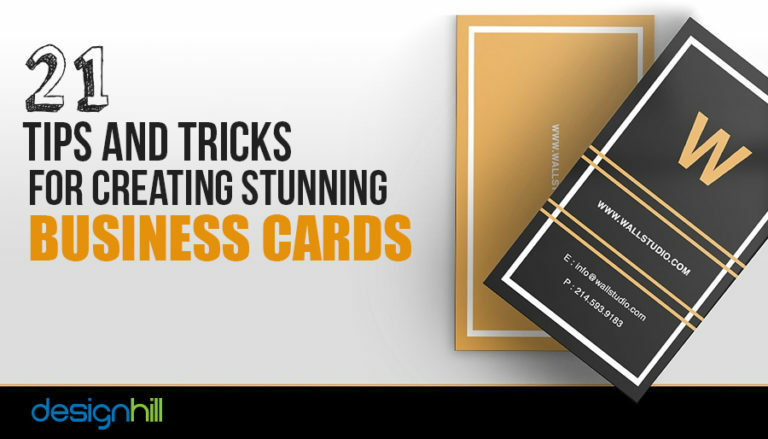 Choose a colorless, plain card style if you run a sophisticated high-end business, Or when you want to make such an impression on your potential clients. When you need to insert information into the limited card space, a proven way is to create your QR Code. The code is the best method to include all of your company’s contact details without making the card appear as cluttered. Additionally, you can establish a link between the content on your website and other online platforms, and printed information. Make sure that your free business cards appear as high-quality finished products of great artwork. So, give it a quality finish. This is the way to make the card stand out from your competitors. You can send out the right signals about your business this way. Therefore, ensure the use of spot-UV, metallic inks, foil blocking, etc to give best finishing touch for a great visual impression. A 3D effect, which gives the impression that the text and the design are raised from the surface, provides the card with a unique look and feel. It also adds style and elegance. This tactic will bring your card to life, and it helps people in recalling your business. Some common pitfalls must be avoided. Stay away from making a straight looking border on all the four sides of the card. It may result in some misalignment during the trimming of your card. Similarly, consult your printer to decide the bleed area so that you do not design anything there. Mostly, the bleed area is 3mm. As most printing is not always precise, make sure that you keep the content away from the border area. So, put everything away, and in the center. You should do this for the practical reasons. Your one side of the card is for giving your company’s primary contact information. At this side, you will put a lot of text. But on the other side of the card, you can put impressive visuals that can speak well for your business. Put a subtle image on this side. It can be your company logo or any other thing related to your business or industry. Different materials are being used as an experiment to create business cards. They are no more solely printed on paper. To look unique and provide some excitement to the recipients, think of using plastic, wood, metal or slate for the cards to make them impressive creative graphic designs that stand out. Before you send your card for printing, do not forget to do some last minute checks on your artwork. It is better than to find out some mistakes after the printing. After all, “Check twice, print once” adage in the industry is there for some reasons. Mostly, people take a thicker card as an expensive card, and it speaks well for a business in terms of its professionalism and quality of products or services. Think of printing your card on a thick paper rather than a paper that gives a 300 gsm thin look and feel. Do not try to overdo the design. Prefer a design that looks simple and uncluttered. Avoid using too many images and colors that can confuse your clients. There should be a lot of space around your logo and other text so that people can write something such as where they got the card. A good layout is essential to creating a unique business card. The layout helps in picking the proper spacing and size so that you can set the crucial elements at the right place and rest of them at one side. The layout decides to place of the information in the right order. A lot of blank space on the card is a good strategy. It lets our eyes focus on the most important details such as your contact information. When you leave plenty of space, it also helps in de-cluttering the business card design with unnecessary elements. If you are thinking of printing your business cards by yourself at home, think of moving to professional printing. If you do it yourself and you are not a trained printer, you may distort the design. Remember that a homemade card may not leave a good impression. While most of the cards do not have a call to action, you should think of it. Make your card a valuable marketing tool by printing some special offer or discounts to your clients. Give instructions to your professional graphic designer to leave some space for a nice CTA (Call-to-Action). Your company’s logo should take the entire one side of the card. It is the face of your company and business. So, it must find a prominent place in term of space and treatment in your card design. There should not be many elements such as colors, text, images around the logo so that your clients can see it at a glance. So, it is not enough that your logo designer created a memorable piece; you should print it on the card in the right way as well for maximum impact. Fonts make a text readable. Prefer using 2-3 sizes of so that a typeface stands out from others in the card design. This also helps in building a hierarchy when you use the text. But make sure that they do not overlap each other. To catch the attention, you can think of experimenting with the shapes. Business cards come in a variety of shapes including squares, circles, and small rectangles. You can stand out from your competitors by creating a non-classic shape. But it should be smaller so that the recipients can keep it in pockets easily. If you have a particular shape in mind, tell that to the graphic design services provider who is designing the card. After you are done with the card, run some test with your audience or your friends. Ask your relatives, experts around you, and your social media followers for their opinion on the design. If they suggest something valuable, consider it. These are the key points to consider while creating some amazing business cards for your company. Pay heed to the minute details so that everything stands out in the design. You can also get the card designed at Designhill, which is a leading marketplace. It has hundreds of designers who know how to create a great impression on your target audience. Business cards are no more just a way to provide clients with a company’s contact details. More than that, the cards have become potent marketing tools to build a brand identity of a business. So, they should be unique but simple designs that can convey your business message. Anne Carton is a small business consultant, designer and an enthusiast blogger working with Designhill, one of the fastest-growing custom design marketplace. She has authored several blogs, articles and editorials on various topics related to interactive content, concerning design, social media strategies, growth hack strategies, digital marketing and e-commerce.